Volumes One and Two, Dr. David (Paul) Yonggi Cho's comprehensive spiritual philosophy on the power of dynamic faith is brought together in one place for completeness and ease of reference. A Senior Pastor Emeritus of Yoido Full Gospel Church in Seoul, Korea, Dr. Cho grounds his belief in his experiences following his conversion to Christianity as a young man and while suffering from tuberculosis. By developing the idea of the spiritual being as the fourth dimension, he ultimately demonstrates how this can, through faith and prayer, influence and effect change in the physical being leading to personal growth and renewal. In these pages you'll discover * A World of Answered Prayer * A Creative Way of Life * Dynamic Faith * True Communion with God * Secrets of a Successful Faith Life. 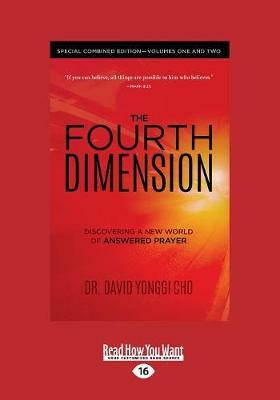 Dr. David Yonggi Cho has also authored such best-sellers as Successful Home Cell Groups, Unleashing the Power of Faith, Solving Life's Problems, Suffering...Why Me, A Leap of Faith, and 4th Dimensional Living in a 3 Dimensional World. "The imminence of my death had brought me to the realization that I needed something greater than a religion, greater than a philosophy, and even greater than sympathy for the trials of human existence. I needed someone who could share my struggles and sufferings, someone who could give me victory. Through reading the Bible I discovered that someone to be the Lord Jesus Christ.